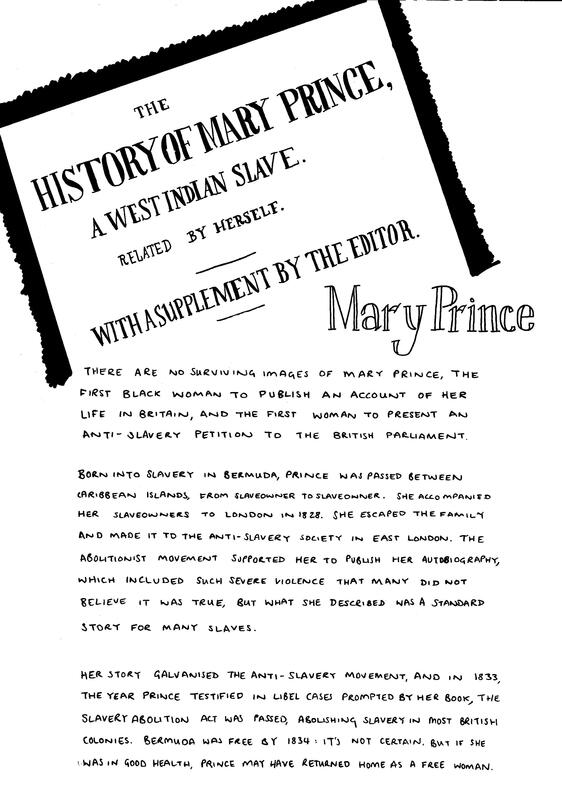 There are no surviving images of Mary Prince, the first balck woman to publish an account of her life in Britain, and the first woman to present an anti-slavery petition to the British Parliament. Born into slavery in Bermuda, Prince was passed between Caribbean islands, from slaveowner to slaveowner. She accompanies her slaveowners to London in 1828. She escaped the family and made it to the Anti-Slavery Society in East London. The abolitionist movement supported her to publish her autobiography, which included such severe violence that many did not believe it was true, but what she described was a standard story for many slaves. Her story galvanised the anti-slavery movement, and in 1833, the year Prince testified in libel cases prompted by her book, the Slavery Abolition Act was passed, abolishing slavery in most British colonies. Bermuda was free by 1834: it’s not certain, but if she was in good health, Prince may have returned home as a free woman.